As America is in the midst of the centennial of our involvement in World War I, historians and the larger nation reflect on a conflict that, at the time, was regarded as “the war to end all wars,” but is largely overshadowed by World War II just over two decades later. Our involvement in World War I, while brief compared to European nations that had sacrificed the cream of their manhood since August 1914, is no less significant. 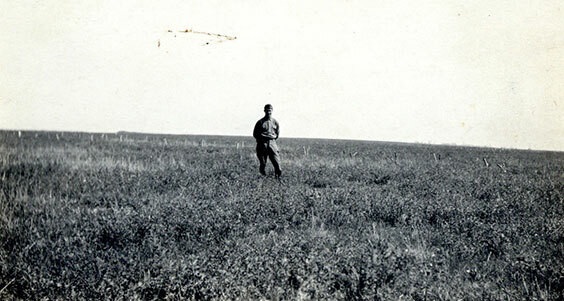 In North Dakota, approximately twenty-eight thousand individuals served in the war and 474 were killed.1 With war raging in Europe and farmers here at home attempting to fill the food gap left by European farmland being turned into battlefields, what insights did the North Dakota servicemen offer in their letters home? The State Archives is blessed to have several outstanding collections that have materials related to World War I on a variety of subjects, from nurses to post-war work with the nascent League of Nations. With several collections to choose from, my focus turned to letters written by soldiers from North Dakota and what these writings had to share. The Howard R. Huston Papers is one collection that stands out. Huston was born in the state and grew up in McHenry County, ND. He attended the University of North Dakota, and enlisted in 1917. While serving with the 4th Infantry Division in France, he saw combat and was wounded. After the war, he worked for the League of Nations, an organization that was meant to model the later United Nations and serve as a forum for the world’s nations to come together and solve disputes through peaceful means. Letter from Howard R. Huston to his parents in which he references meeting Charlie Chaplin. In one of his early letters home (before shipping overseas) Huston mentioned meeting and dining with legendary entertainer Charlie Chaplin and running into several fellow North Dakotans where he was stationed. 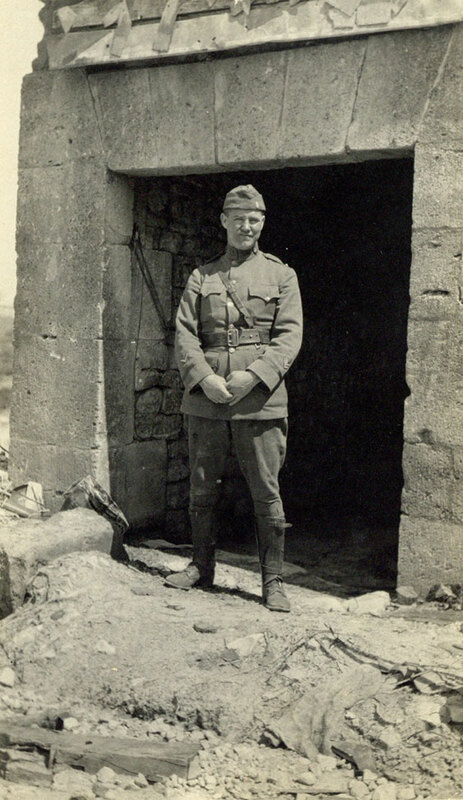 In addition, he expressed his love of the work he was doing in the army at the time, further noting that being a soldier in wartime is “no more dangerous than any other work.”2 It is important to note that Huston had yet to experience combat himself, and such optimism and exuberance is a common thread in soldiers’ writings prior to their arrival at the front. While in the trenches of France, some common themes emerged from soldiers’ writings, usually revolving around comforts of home, awarding of medals and decorations, and anxieties over combat. In a letter home to family dated April 7, 1918, Corporal G. McClain Johnson of Company L, 164th Infantry Regiment, which was the North Dakota National Guard, discussed the impatience at waiting for the word to go into combat, as well as his impatience at getting word from home. He also wrote, “Whenever the notion strikes you to send something over this way remember that these are three articles which are acceptable over all else. They are—magazines & newspapers, candy, and Tobacco.”4 Though the writings avoid specific details related to combat operations, the fears some soldiers had were hidden within the words. It is important to note that letters home faced screening by military censors to avoid disclosing sensitive information related to operations, and that soldiers may well have felt uneasy sharing such experiences with those who would not understand, having never served. No more wondering if the next shell got your number on it or not. No more wondering what time of the night you have to get up and out to the lines and do some small Job of some kind. Overall, the writings reflect the diversity of the American soldier from North Dakota in World War I, while reflecting the commonality of the shared experience of serving in the greatest war the world had known to that time. The men expressed their feelings of service, the concerns with coming battle, missing home and family, desire for letters and gifts from loved ones, and some of the unique experiences they encountered during their time in the military. The writings of World War I veterans are a window into a long ago time that must not be forgotten, as the war and their service in it continues to shape the world. 1“World War I,” North Dakota Department of Veteran Affairs, accessed August 18, 2017, http://www.nd.gov/veterans/heroes/conflicts/world-war-i. 2Howard R. Huston to parents (original letter), undated, Howard R. Huston Papers, box 1, folder 1, North Dakota State Archives, Bismarck. 3Anton Peterson, The Diary of Cpl. Anton Peterson, 18th Inf. Co. D, 1st Div. A.E.F., War History Commission Records, box 2, folder 11, North Dakota State Archives, Bismarck. 4G. 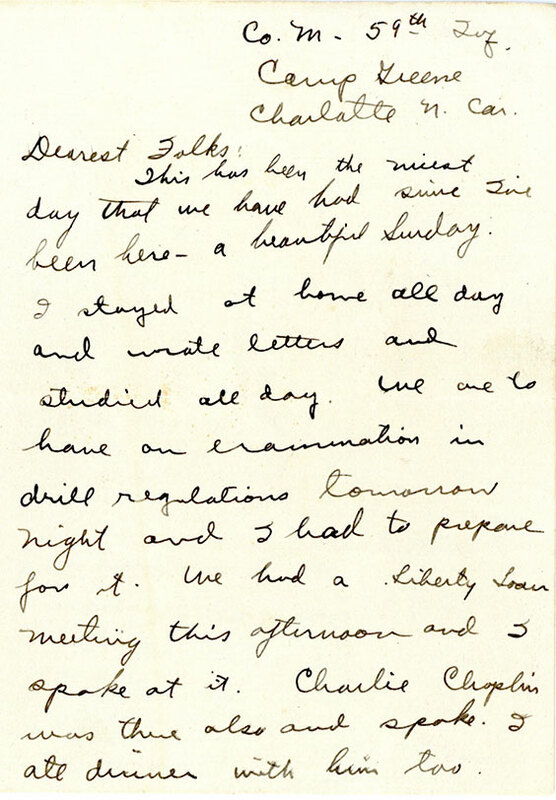 McLain Johnson to parents and Eva, 7 April 1918, War History Commission Records, box 2, folder 20, North Dakota State Archives, Bismarck. 5Oscar O. Haugen to family, 25 November 1918, War History Commission Records, box 2, folder 14, North Dakota State Archives, Bismarck. 6Oscar O. Haugen to father (written in Norwegian), 22 December 1918, War History Commission Records, box 2, folder 14, North Dakota State Archives, Bismarck.